When Sol Republic announced that it had got Calvin Harris to studio tune its XC headphones, we felt a wave of apathy. Was such a branding exercise really necessary? But when we took a closer look at these cans something about them stood out. We just had to get a pair in and listen to as much music as we could to see if these over-ears could deliver on the three-point mantra that any good pair of headphones needs to achieve: they need to be solid, comfortable and deliver great sound. Tick boxes at the ready, it seems like our gut reaction was bang on - and there's more to these cans that just a well-known producer flogging his name to shift a few more pairs. 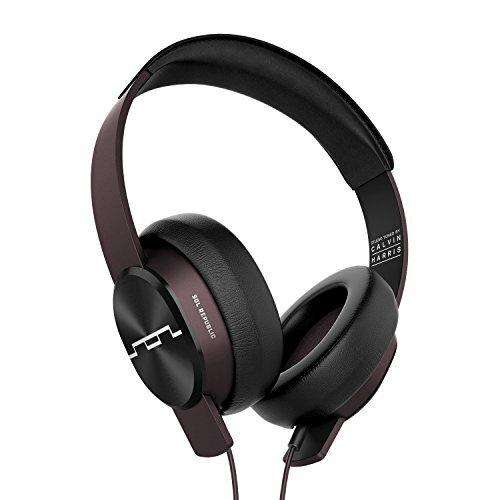 Are the Sol Republic Master Tracks XC headphones able to earn their keep for the £230 cover price? The first thing that's different about the XC headphones is that they come disassembled - the headband and the ear cups are separate and must be mounted once you unpack them. But this modular approach is a great touch as it means if something breaks it can be repaired or replaced without having to buy a whole new set. The second thing you notice is that they look great too. There's nothing here that overly screams "celebrity endorsment" that might otherwise set alarm bells ringing. The only Calvin Harris branding is on the inside of the headband, so no one will know what you're wearing, unless they really know the headphone market. It's either going to be a proud or dismissive secret depending on whether you care less about such branding or not. For our money we like such subtlety. It might not appeal to those who are magnetised to, say, Beats headphones, because Sol Republic has avoided this being just one big marketing exercise. At least, that's now how we felt, but perhaps we've been brainwashed at some point. You can decide for yourself though. There are clever design bits too. Firstly, you get two audio cables, one is long for hi-fi use, the other is short for mobile listening. The longer one has a place where you can store the jack adaptor too, it screws on so won't get lost and will always be where you and the headphones are. That's really clever thinking. The shorter lead also includes the iPhone-compatible volume control, multifunction key and microphone. The Master Tracks XC come with a soft headband that's a real top job. To touch it feels like it's made from quality material and that wears well too without generating extra unwanted sweat. Although we don't believe it to be real leather, it's certainly a decent looking synthetic alternative and a material that offers enough breathability. We don't love headphones that clamp your head too tightly, or headphones that are so loose that they come off when you attempt that Fresh Prince head-roll that we love so much, but the XC seem to strike a good balance. They're more on the head-clamp side of things, but we've worn them for hours without becoming uncomfortable. They fit nicely over the ears too, which means you don't get that pressure against your shells that can become bothersome during long listening sessions. No pinned-back ears means longer, more comfortable listening. The Master Track XC are, pretty much, perfect in terms of fit. If we had one niggle, it's that the headband makes adjusting the cup height a bit more tricky than most headphones, but it does also mean that you can set them up once, and not worry too much about them unwontedly shifting around. The very first time we put the XC on to listen we felt there was a lot going for them. As we carried on over the days and weeks our feelings further developed for the better. These things sound utterly brilliant. Firstly, the bass. There's a lot of it. Now that's not always a good thing, because too much bass isn't how music should necessarily be heard. Ideally, it should be flat, and as close as possible to what the studio engineer heard. And the point of these headphones is that they are tuned by a man who spends a lot of time overseeing studio mixes. So as much as we may have sighed at Calvin Harris's name being used, it actually makes a boat load of sense. Sol Republic claims that the bass "attack" is fast, which means you don't get that nasty wallowy bass that spoils the rest of the mix. We'd have to say we agree. The bass reproduction is incredibly tight, the headphones feel like they could blast short, stunning low-frequencies at you in rapid succession without becoming a mess. But all of that low-end is for nothing if the high-end and mid-range are lost. But they aren't. Vocals are as clear here as you could hope. Take a listen to Anna Kendrick's When I'm Gone and you can hear all of the clapping and crisp vocal that you'd expect. It's really rather fabulous we have to say. Same goes for Ellie Goulding's Burn, which has a great bassline, but also makes use of Goulding's unique voice. It sounds great, if a little bright at times. We listened to both music streamed from Google Play, and our own collection of losless digital audio, including Calvin Harris' own track I Need You Love. Calvin Harris tuned, and perfect for vocal pop it seems. Although the asking price for these Sol Republic headphones isn't a snip for most people, we think the build quality will see them last a very long time. Sol Republic says the headband is "virtually unbreakable". We didn't put that to the test with industrial tools or anything, but it did feel very strong for day to day wear. If you did snap it, somehow, then it can be replaced as an individual part. The modular approach is a good one. Perhaps most importantly is the sound quality. And we think the Master Tracks XC totally nail it. Perhaps this isn't the best pair of headphones to buy for classical music, or jazz, but we think for most of what the young people will want to hear, they are pretty much spot on. Then the "celebrity endorsment" part. It's subtle to the point that you can lap it up or ignore it. And we'll pay our dues here: we've never met Calvin Harris, but if we do ever see him in the street - and, of course, are even able to identify him; it all gets harder as we get older - we'll be sure to congratulate him on a pair of headphones well-tuned. And Sol Republic deserves a big stack of credit too, because tuning is nothing without good hardware to work on. The more we've been listening to music lately, the more we've wanted to listen using these headphones. We think they're great.